iTunes Match works very well, but will this model ever be scaled to other content producing industries? Remember a few years ago, when Apple first effectively created the online music market with iTunes, then later put the first, second and third nails in the coffin of stupid DRM on music files? We can but hope that its new Music Match is the next big step, and not just for audio. The basic idea is this. 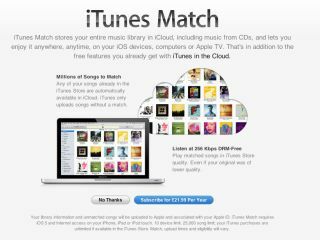 Assuming you already use iTunes, you can now pay Apple a subscription fee of £21 a year to store your music in the cloud. On its own, that's no big deal. We've seen plenty of music lockers come, go, and be beaten into submission by paranoid companies and their expensive lawyers. What makes this one different is that while it will happily store any music you own, anything it simply recognises instantly becomes available from the iTunes Store as a legal, high-quality 256kb download, regardless of the quality of your copy. Awful, scratchy tape-rip? Doesn't matter. At the tap of a button, you get the whole thing delivered to your account. Up to 10 machines can be attached to your account, accessing up to 25,000 of your songs (not including iTunes purchases), and either streaming or downloading them as unprotected files. The only real disadvantage to the system is that if you have your music in better than 256kb quality, it'll be downgraded. I signed up for the service over Christmas, and it's worked as well as anything that requires the ghastly iTunes can be expected to. It took a while to match even my paltry music collection, and had to upload a few things even when the software matched everything else in an album, but nothing's perfect. So far, I have no big complaints about it. As so often though, the really interesting thing isn't how well this specific service works, but the fact that it exists at all. Despite having the music industry's blessing to exist, Music Match has somewhat justifiably been described as a pirate amnesty. Throw in an MP3, get a decent quality version of the song streamed straight from the biggest online music store. You can see their point, even if it is balanced by the fact that music piracy is already an epidemic and that being inside the iTunes ecosystem of one-click purchases and built-in recommendations could at least encourage more people to take the legal route. At least, it won't hurt. The real shift though is to ownership itself. Every content industry has vacillated between two main systems to suit its convenience - a license to consume the media when it comes to things like resale and a file when it comes to questions of backup or format-shifting. To quote former MPAA president and human being Jack Valenti, "If you buy a DVD, you have a copy. If you want a backup copy, you buy another one." Music, video, books... the question of who owns what in our increasingly digital world is going to be one of the most contentious for the foreseeable future. Considering this, Music Match is an amazingly brave step - not for Apple to implement, but for the music industry to allow. After all, it was only last August that MP3Tunes was in court with EMI over merely letting users store dodgy tracks on its servers, never mind handing out better copies of the uploaded material. Whatever kickbacks or deals may have been made behind the scenes to facilitate it honestly don't matter in the grand scheme of things. The existence of services like these normalises the idea that they should exist, in much the same way that nobody bats an eye at music streaming in a post-Spotify world, or seriously gives any thought to lost sales through a lack of music DRM. That's still not the case for other content types, but give it time. Hopefully. For video, the main push towards this model is likely to come from the increasing popularity of rentals. Right now, you can sign up for an unlimited Lovefilm subscription (including streaming) for less than the price of a DVD, and Netflix is joining the party later this year. Moving movies to a buy-once-get-wherever system would at least be one way of justifying the cost. With the right deals in place to pay lower royalties, it would be in Apple and Amazon's interest to do the same thing for books, since getting a customer into their ecosystems is worth far more than the chance that every new Kindle owner is going to fill up on their current library instead of looking for new things. Previously, the very idea of this has seemed stupid on the grounds that the content providers would never tolerate it. With music leading the way though, it suddenly seems like a very real possibility. At the very least, the way is open for small steps - a purchase of a book coming with the Kindle edition as standard, a movie being available for immediate streaming while you wait for the physical copy to arrive. The more digital the world becomes, the more options and opportunities everyone has. It's great to see at least one industry - if not exactly embracing the future - being willing to give this one a try.